Link monitoring software sends an alert email notification to the user if link is unavailable, status of link is not found or advertiser’s page is not displayed on publisher’s site. 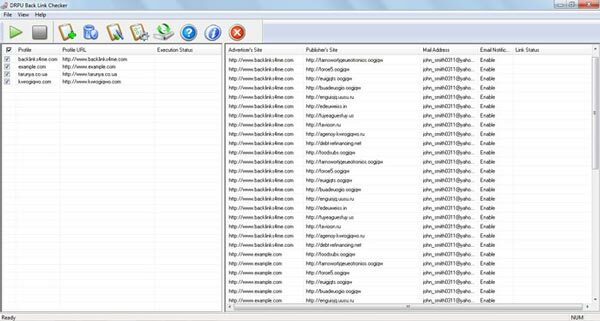 Link tracking tool finds the anchor text link and provides genuine way to check the link status of advertiser’s site on publisher’s site. Software generates the back link analysis report of the link status in HTML or TEXT format with user friendly wizard style interface. Check the backlink status of your websites on publisher site. Find out anchor text of links and other information on your (advertiser) website. Facilitate to check the status of back links pointing to publisher’s site. Sends notification to user specified email ID if backlink is not present or page is not displayed on publisher’s website. Detailed report of backlink status is generated in text or HTML file format for future reference. Easy to use link checking tool is easily operated by non-technical person.